For a refreshment and also for a delicious and inexpensive meal: choice of grilled fish, lamb kebabs, rice pilaf, vegetables, drinks and Turkish sweets, coffee or tea, Café Mesale restaurant offers the most pleasant lunch break from the rush of sightseeing. 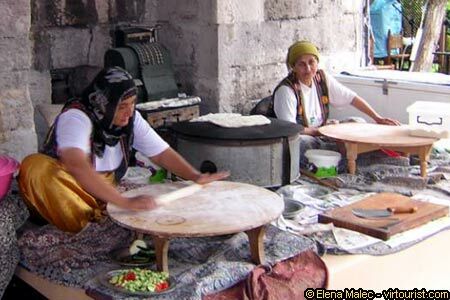 In the photo, making fresh bread at Café Mesale; these Turkish women wear basma (headkerchief) and salvar- traditional baggy trousers that today can be seen mostly in rural Turkey. After lunch you can walk along the market street to its southern side where in a garden with ancient columns and capitals you'll find the entrance to the Mosaics Museum.